"We see kids run off like this every day…" Gunpowder & Sky have debuted another official trailer for an Australian horror-thriller titled Hounds of Love. The film is set in Perth, Australia in the 1980s and is actually based on the true story of a crime known as the Moorhouse Murders. We also posted the first US trailer one month ago, but here's another one for those interested. Ashleigh Cummings, Emma Booth, Stephen Curry star, along with Susie Porter, Damian de Montemas and Harrison Gilbertson. Hounds of Love is described as an "exercise in expertly-crafted tension, offering a bold, challenging debut" from filmmaker Ben Young. The film already played at the SXSW and Tribeca Film Festivals this year, and opens in theaters (+ VOD) this May. Very disturbing, not for everyone, but it's apparently a damn good film. You can still watch the first official US trailer for Hounds of Love here, to see even more footage from this. In suburban Perth during the mid 1980s, people are unaware that women are disappearing at the hands of serial killers John and Evelyn White. After an innocent lapse in judgment, Vicki Maloney is randomly abducted by the disturbed couple. With her murder imminent, Vicki realizes she must find a way to drive a wedge between Evelyn and John if she is to survive. 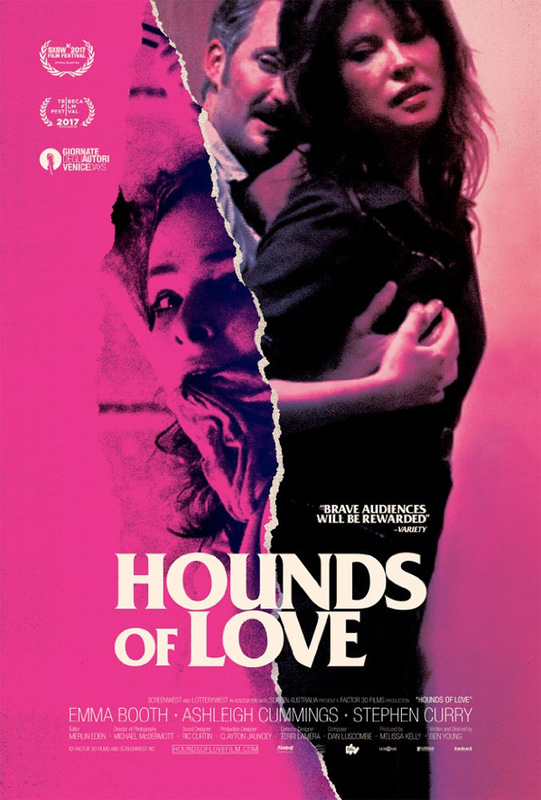 Hounds of Love is written and directed by Australian filmmaker Ben Young, making his feature directorial debut after a few short films previously as well as episodes of "Prank Patrol" and "Castaway". This already premiered at the Venice Film Festival last year, and is playing at the SXSW Film Festival this month as well as the Tribeca Film Festival next month. Gunpowder & Sky will open Hounds of Love in select theaters + on VOD starting on May 12th coming up. Interested?